So I heard though the grapevine that there’s a place in Hintonburg that’ll make you a vegan crepe. It’s called “A Thing For Chocolate”, and Neil and I just went there for brunch. 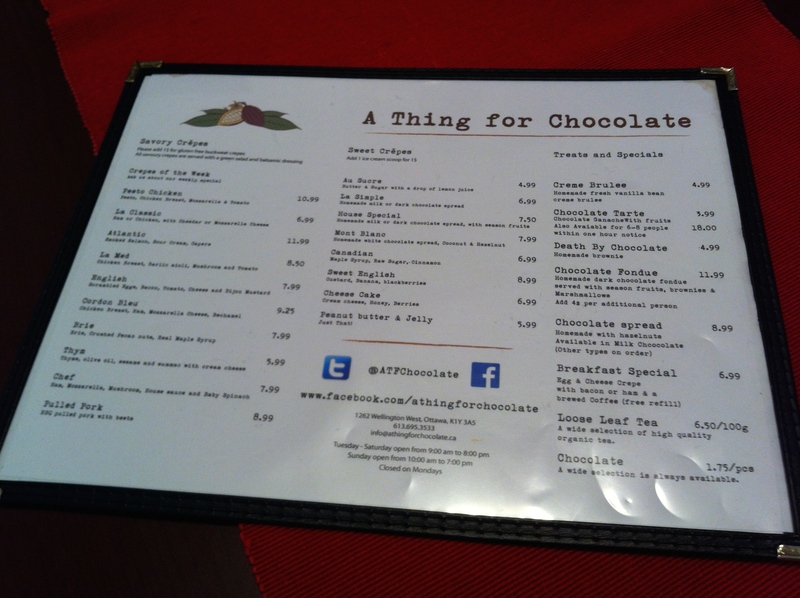 The atmosphere is cheerful and unpretentious, decorated with framed quotes affirming that chocolate is good for you and you’re probably not getting enough. There were only a couple of vegan options on the menu and they were pretty plain. 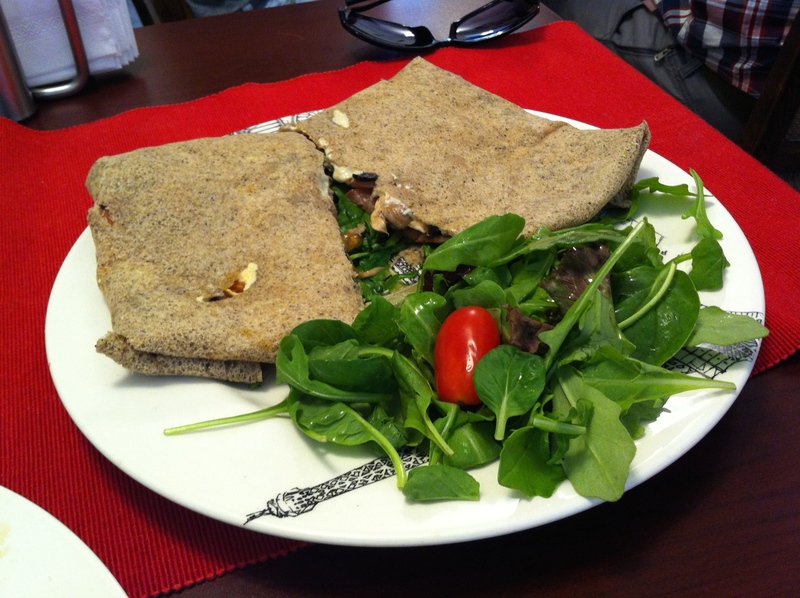 When we placed our order, however, we discovered that they also make a savoury vegan crepe. Called “The Vegan,” it’s filled with Daiya, basil leaves, mushrooms and tomatoes. I was kind of surprised when the crepes arrived, because they were brown. Omar the owner informed us that they’re made of buckwheat. I’m not sure what that’s all about – if it’s a conflation of gluten-free with vegan or if he just thinks vegans like healthy looking brown things. But who cares – they were good, and Omar was such a dear and so eager to bring in more vegan options, I didn’t want to get in his face about the brown crepes. 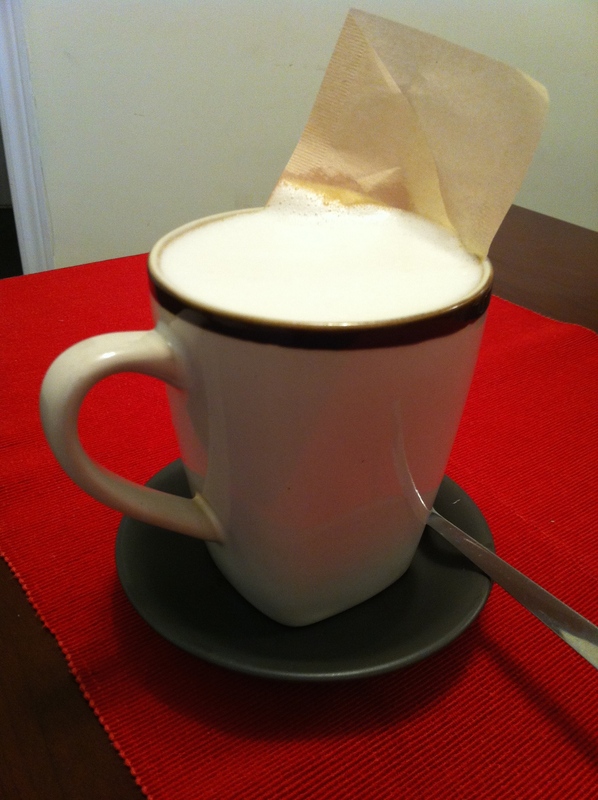 The “London Fog” – Earl Grey tea with almond milk. Speaking of, we told Omar to get Earth Balance, President’s Choice meatless chicken breasts and Tofutti Cream cheese to make his menu more vegan-friendly. I encourage you to contact him if you have any other suggestions. Honestly, I kind of drew a blank when he asked me. Partially out of excitement and partially because it started giving me flashbacks to our ill-fated Restaurant Outreach Program (let us never speak of it again). 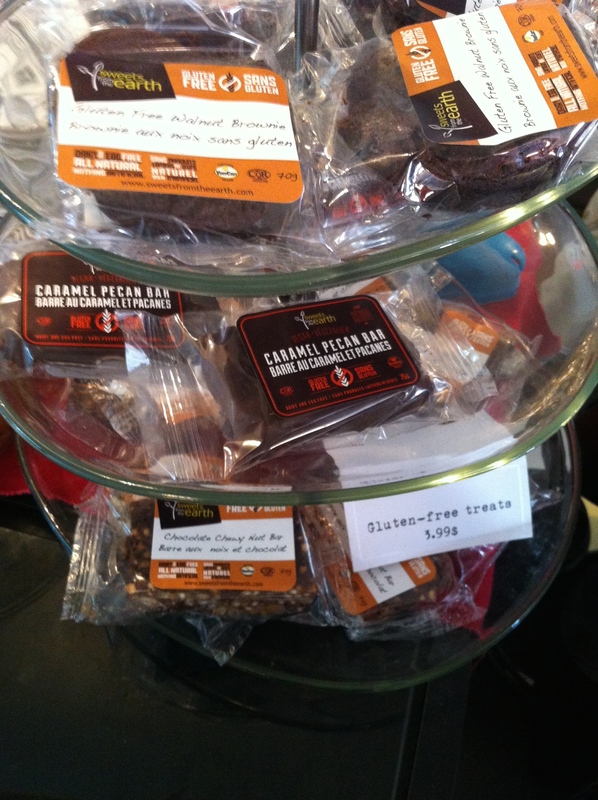 Sweets from the Earth goodies at the counter! 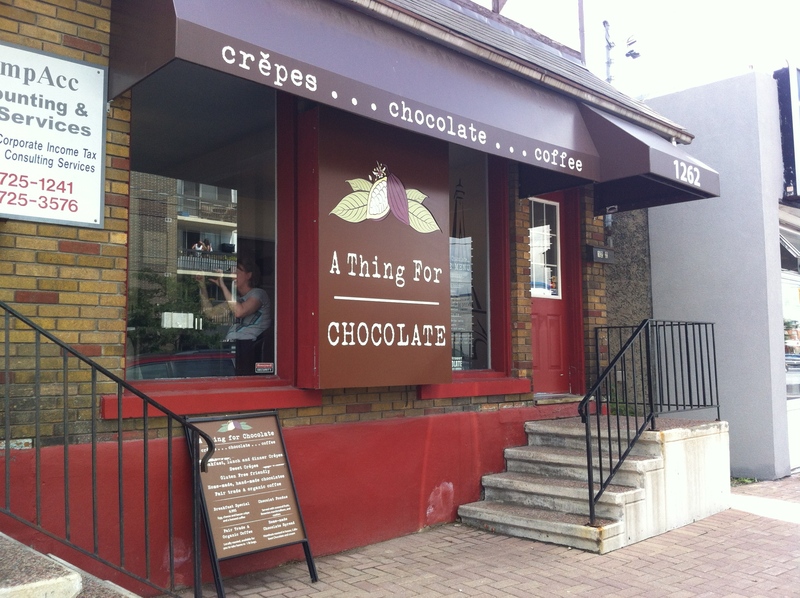 So there you go – vegan crepes in Ottawa. In yer face, Toronto. Addendum: After posting this blog I discovered that everyone except me knows that traditional savoury crepes are always made with buckwheat *looks down in shame for being an uncultured mouth-breather*. All savoury crepes are made with buckwheat flour, when they are made properly/traditionally. It was surprising to read what seemed like a surprised/negative reaction to it, especially on a food blog! You’re not the first to mention that – see addendum 😉 But anyway, I didn’t mean it negatively – I thought they were really good. While I’m not vegan, my daughter is, and Omar has eagerly accommodated her dietary choices on several occasions. He and his restaurant are a treasure to the neighborhood, and it’s great to see people spreading the word. I am pleased to announce that, thanks to the guidance of the NCVA, we have just launched our new menu with a few vegan options. We are always open for new suggestions and our menu can be changed anytime we want (the beauty of “not a franchise”). I look forward to welcoming you all!